One of the area’s leading chimney sweeping and repair companies, Top Hat Chimney has been serving the South King County and Pierce Counties since 1979. 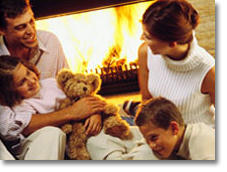 Family owned and operated, each member of the crew is specially trained in the art of chimney cleaning and repair. Based in Puyallup, Top hat is the premiere Federal Way chimney cleaning company that brings to the table several decades of experience in the chimney cleaning and repair field. As a Guild Member who is licensed, bonded, and insured; know that your family's safety is Top Hat Chimney's main concern. Top Hat Chimney will service both open masonry fireplaces as well as factory built fireplaces; each one has its own recommendations by the Chimney Safety Institute of America on how often they should be cleaned and inspected. Top Hat is a full service chimney cleaning company handling all phases of chimney care - inspections, cleaning & sweeping, and repair every step of the way. Call today with questions or for a free estimate on your chimney repair needs.